The quest for religious freedom plays an important role in immigration, although in some cases religious freedom is one issue among many, as people seek both personal freedoms and economic opportunities not available in their home countries. However, in this case, religion was the preeminent reason for leaving homelands, as the migration in question was due to religious persecution. What became known as “the Partition” gave birth to a new nation called Pakistan, and one of the biggest mass migrations ever seen. The end of the British Empire in India in August 1947 resulted in the creation of the two separate states of India and Pakistan. India and Pakistan won independence in August 1947, following a nationalist struggle lasting nearly three decades. The division was based on religious lines, a Muslim majority in Pakistan and a Hindu majority in India. Pakistan itself was split into two parts, in the east (East Bengal, which became Bangladesh in 1971) and in the west (western Punjab). Unfortunately, this event was to result in the largest mass migration in history. 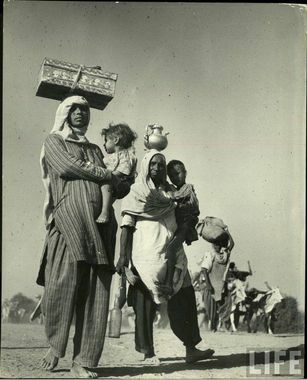 Muslim residents of the former British India migrated to Pakistan (including East Pakistan which is now Bangladesh), whilst Hindu and Sikh residents of Pakistan and Hindu residents of East Pakistan (now Bangladesh) sought refuge in the opposite direction. There were many cases of deadly attacks on some Muslims who chose to stay in India, though there are still 80 million Muslims in India today. There were many cases of deadly attacks on some Hindus and Sikhs who chose to stay in Pakistan. This compelled over 15 million people to join their particular religious majority, and thus cross India. What was worse was the persistence of organised attacks on the road convoys of refugees, and increasingly frequent ambushes of trains carrying evacuees in spite of the presence of strong military escorts. For instance, within the four days of the 19th to the 22nd of September 1947, seven attacks by armed gangs were made on special trains running between Delhi and Lahore in both directions and carrying members of minority communities. In some of these attacks heavy casualties were inflicted upon refugees of both communities. An estimated 1 million people died along the way, from 1947 to 1948, many facing a violent end. It is also reported that about 75,000 women were abducted and brutally raped by people belonging to the opposite faith. Thus the India–Pakistan Partition resulted in one of the largest forced migrations of the 20th century. The impact religion had on this migration flow did not just put India and Pakistan through a major social and economic crisis, it also resulted in a new pattern of immigration. Indeed, this forced immigration repeated itself during the Bangladesh Liberation War in 1971 when once again Hindus were forced to leave because of religious persecution. Moreover, in modern India, estimates based on industry sectors mainly employing migrants suggest that there are around 100 million circular migrants in India. Caste, social networks and historical precedents play a powerful role in shaping patterns of migration. Migration for the poor is mainly circular, as despite moving temporarily to urban areas, they lack the Social stability and benefits which might keep them there more permanently.